In 1957-8, the full professors were Carl Hempel, Gregory Vlastos, and Ledger Wood; the associate professors were Walter Kauffman, James Ward Smith, and Arthur Szathmary; and the assistant professors were Douglas Arner and Hilary Putnam. 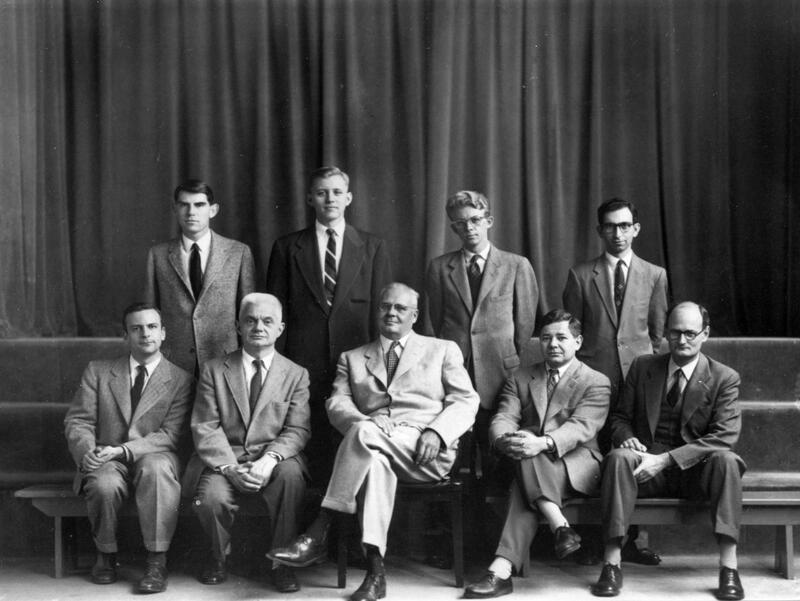 Other faculty teaching that year were Paul Ziff, Frithjof Bergmann, R. J. Butler, Price Charlson, G. Dennis O'Brien, Thomas E. Patton, George W. Pitcher, and Paul Benacerraf. The department also had a number of visiting professors, including three who would later become the most famous defenders of utilitarianism: Richard Brandt, R. M. Hare, and J. J. C. Smart. In an email written in 2008, Smart described his visit to Princeton in the following terms. About Princeton in 1957: it was rather a one-off. I was on study leave at Oxford when I got the invitation to Princeton. It did not lead to the ongoing close connection between there and Oz that exists today. I had one third year undergrad class and one grad class. In the latter class I had the two Jerries (Fodor and Katz)... The grad class was advertised as on Wittgenstein and Ryle but mostly we got on to the identity theory of mind to which I had been converted (from Wittgensteinian-Rylean behaviorism) by U. T. Place (I should also mention Charlie Martin). I went up to Cornell and read a precursor of 'Sensations and Brain Processes'. Brandt was at Swarthmore, but gave a class once a week at Princeton and I went to it. I went to one of his in Swarthmore and it was excruciatingly long: 2 or 3 hours. He was a nice chap. I came immediately to prefer his terminology of 'act' and 'rule' [utilitarianism] to my 'extreme' and 'restricted'. The Hares were at Princeton the same term and Janet and I became good friends of Catherine and him. We were fairly much in agreement on metaethics. He had a great hatred of cognitivist meta-ethics. My visit to Princeton in 1957 was I suppose partly causally responsible for Hempel coming some time later to give Gavin David Young Lectures at Adelaide. Many top philosophers have done that. The other Princeton philosophers who have given the Gavin David Young Lectures at Adelaide include Donald Davidson, David Lewis, and, most recently, Frank Jackson. Hilary Putnam had joined the department as Visiting Assistant Professor in 1953, was appointed Assistant Professor in 1954, and gained promotion to Associate Professor in 1961. Paul Benacerraf was a beginning graduate student in Putnam's first year at Princeton, and he and Putnam immediately became firm friends. Shortly before Putnam's retirement from Harvard in 2000, Benacerraf was asked to make some remarks about their early years together. Those remarks, which can be read here, paint a vivid portrait of philosophical life in the Princeton Philosophy Department in the mid-1950s.